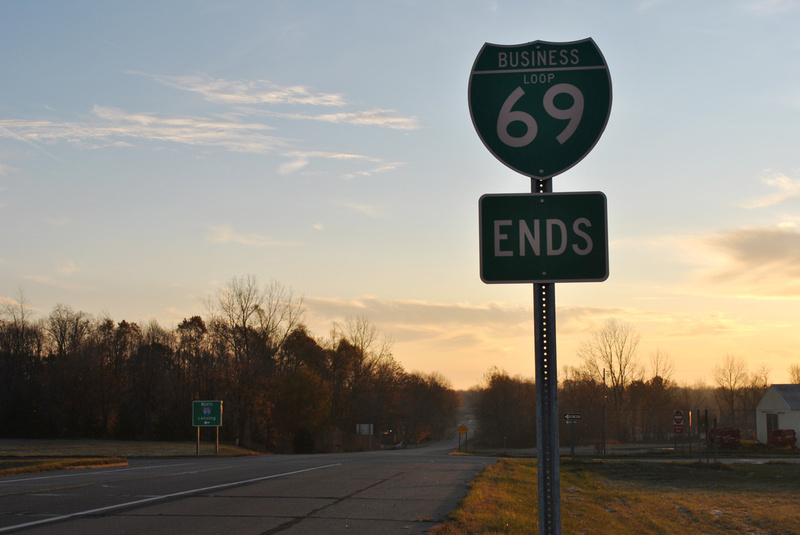 Interstate 69 has four active business loops in the state of Michigan. Business Loop I-69 connects I-69 with the Branch County seat of Coldwater from Exit 10 to the south and Exit 13 to the east. 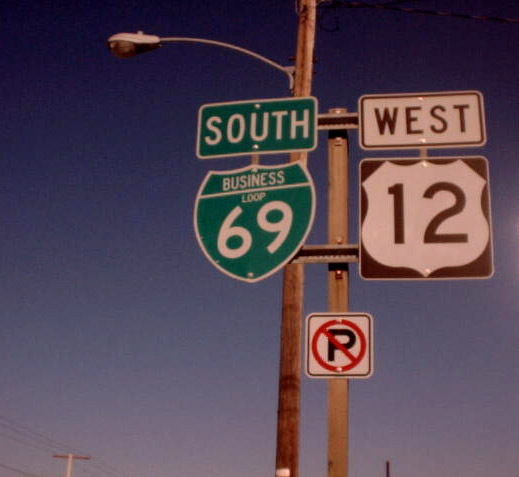 The business route overtakes Old U.S. 27 along Angola Road and Division Street north to U.S. 12 (Chicago Street) in Downtown. The 5.1 mile route overlaps with U.S. 12 east to a commercialized parclo interchange with Interstate 69. Replacing U.S. 27 Business in 1974,1 Business Loop I-69 lines old U.S. 27 (Cochran Avenue) north from Exit 58 to the Charlotte city center. Lawrence Avenue and Lansing Street angle the route northeast back to I-69 at Exit 61.
Business Loop I-69 stems east from Interstates 69 & 96 at Exit 93 alongside M-43 (Saginaw Street) to Waverly, Lansing Mall and Edgemont Park. 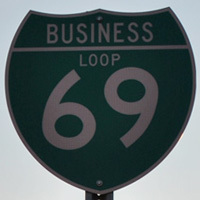 Once within the capital city, Business Loop I-69 separates into a couplet using Saginaw Street east and Oakland Avenue west. The one-way streets converge at the split with M-43 (Grand River Avenue). Saginaw Street turns northeastward from there along a divided arterial and ends at a trumpet interchange (Exit 94) with I-69. Interstates 69 and 96 merge to the west of Port Huron at a semi directional T interchange. The exchange ties into a wye interchange with an expressway spurring southeast to the couplet of Griswold Street west and Oak Street east into the city. Designated as Business Loop I-69, the couplet leads east to Business Loop I-94 (Military Street) near the St. Clair Riverfront. The two business routes combine northward along old U.S. 25 to Downtown. Following Huron and Pine Grove Avenues, the pair tie into I-69 & 94 at the south end of M-25 and west approach to the Bluewater Bridge linking Port Huron with Point Edward, Ontario. When the M-21 freeway was completed in 1984, it was designated as an extension of I-69 east from Flint to Port Huron. The former trunk highway east from Port Huron Township to M-25 (Military Street) was subsequently redesignated as Business Spur I-69. Southbound Business Loop I-69 and westbound U.S. 12 in Coldwater just west of Interstate 69 Exit 13. Photo taken by Jeremy Lance (07/00).